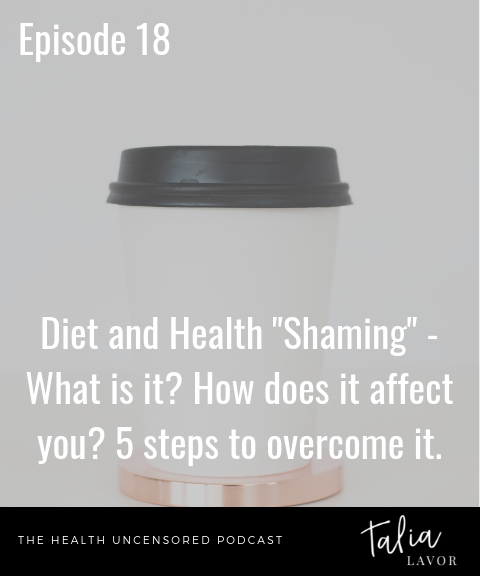 Diet and Health “Shaming” – What is it? How does it affect you? 5 steps to overcome it. If you’re like most women, you’ve heard about “body shaming”, but have you heard of “Health or Diet Shaming? ?” Probably not, because I just made it up! But stick with me on today’s podcast episode! This is a real thing and chances are you’ve been impacted by it at some point or another. Here’s the deal. You are an ever evolving, changing and dynamic individual, and your needs can change over days, months or years. It is not only your right to listen to your intuition and make changes that serve you and help you feel amazing, it’s your purpose!! We are here to feel energetic, joyous and vibrant. And part of that journey is giving our bodies what they need to make it happen. Today we are talking about 5 steps to free you from any dietary or health box or label so that you can be free to feel your best.